Vanns Spices was founded in Baltimore, MD in 1981 to provide premium quality seasoning blends and spices for the professional chef and cooking enthusiast. 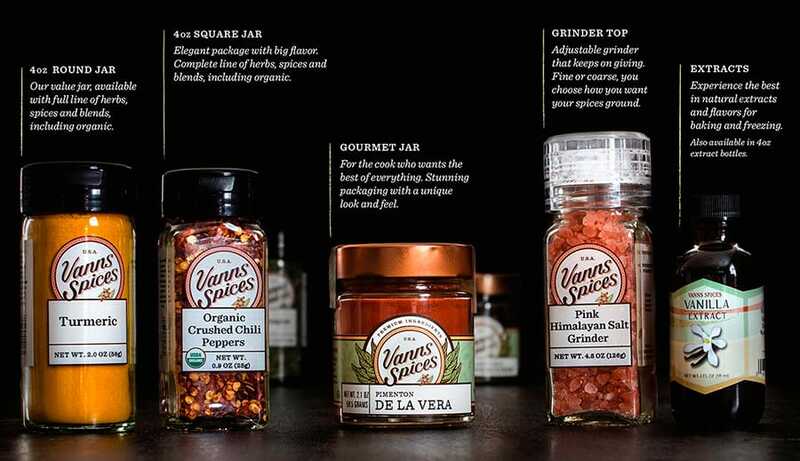 Today, Vanns supplies spices and spice blends nationally to premier grocery chains, smaller specialty stores, top chefs and restaurants, as well as food manufacturers. Vanns also has a huge following with BBQ competition chefs and restaurants, as well as pizza and falafel store chains. Guided by our commitment to great taste, health and sustainability, Vanns continues to scour the world in search of unusual spices and to develop new products. dedicated to the very best culinary experience. Our employees are committed to our success and strive to exceed our customers expectations. We are confident that your culinary experience with Vanns will be a positive one, and delighted to have you as a customer. Over 350 premium quality spice products. Our spices are never irradiated and are all natural. Our spices are available as private label for selective retailers and foodservice industries. Need a custom blend? We can create a consistent product based on your own recipe or we create a blend based on your exact needs. Vanns can also manufacture, package and label your spice product which can be shipped to your store or a preferred distributor.